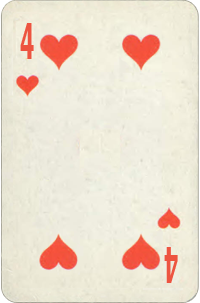 Four Of Hearts In Jupiter. Destiny Cards Free Reading. You Are In Your Jupiter Period! Traditionally described as the "Greater Fortune", Jupiter governs joy, luck and wellbeing. He rules our potential for growth and expansion on many levels: physical, intellectual, spiritual and cultural, along with the accumulation of material assets, power and status. Jupiter describes our optimism and aspirations, but he also rules cultural pursuits, religion, powerful males, government and matters of state. In this sense, Jupiter stands for leadership and the rulers of the community, as his domain covers high officials, bishops, kings, generals, presidents, business moguls and the like. Heads of organized structures, rather than individual heroes. Jupiter also governs our interests in faraway places, travel, foreigners, academic and artistic types, cultural endeavors such as publishing, higher education, structured personal development, healing, government and religion. Jupiter is a risk-taker, so also rules gambling and speculation, adventure—and moving into unknown territory. This is the most beneficent period for you. The card in Jupiter tells you where your strengths are and what areas of life will be affected. Four Of Hearts Basic Meaning: Heart Foundation and protection in love, marriage, family.